A few weekends back James and myself hopped on an overnight Megabus from London to Cornwall after being invited by Travelodge to swap the city for the sea for a couple of nights. As much as I do adore London, it can also be a little overwhelming and I really do appreciate getting away from the city from time to time, so Travelodge's offer was much welcomed. The last time I visited Newquay before this trip was nine years previous when a bunch of my school pals went on a camping/clubbing holiday (lol), so I was looking forward to experiencing it in a completely new light. The bus is easily one of the cheapest options for travelling down to Cornwall, but it is a long-winded journey taking just over seven hours or so. We arrived bright and early into Newquay town centre at 7am on a Friday morning after a broken and unsatisfying sleep on the bus, so we ditched our suitcases at the hotel (check-in wasn't until 3pm) and then headed straight into town to get a well-needed coffee! 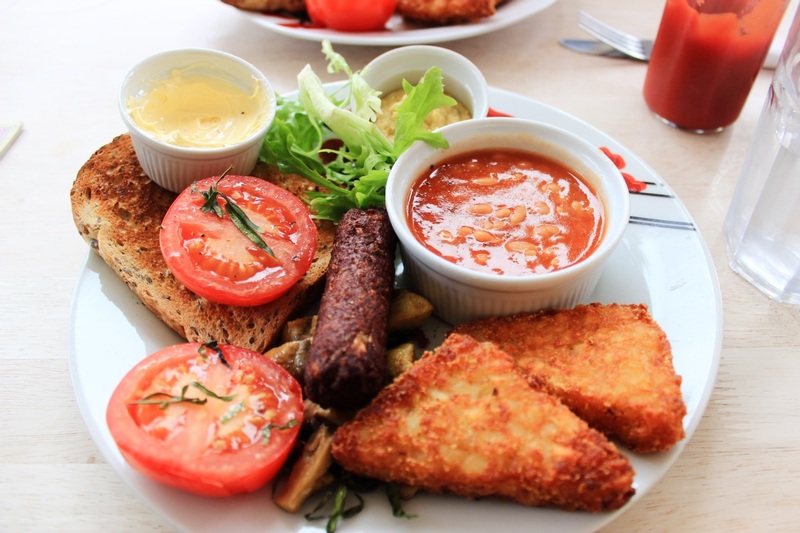 After wasting away a couple of hours in the coffee shop and nursing our drinks for as long as possible whilst stretched out on the sofa, our stomaches began to rumble and led us on the search for breakfast, specifically a vegan fry up. After seeking out TripAdvisor's #1 option, Cafe Cloud, and being thoroughly disappointed with their menu outside the shop, we continued to drag our tired selves up the hill to discover a big shining beacon of a sign pointing us in the direction of The Beached Lamb with vegan options. The cafe is a quaint, vintage-inspired little joint filled with an eclectic collection of cute trinkets and tidbits. It does serve meat too, but the it does have a pretty good selection of vegan and gluten free options in comparison to most eateries which was great for us! Our fry-up which consisted of a vegan sausage, mushrooms, hash browns (what did we do in life to deserve hash browns?! ), tomato, toast, baked beans, houmous (questionable with a fry-up, but it worked!) and some dairy free 'butter' set us back £7.50 each but the portions were pretty substantial! Our few hours left before check-in gave us enough time to explore the local area area around our seafront hotel and get our bearings. I'd browsed through Travelodge's tips for things to do in Cornwall beforehand, which gave me a rough idea of what I wanted to do over the course of the weekend. It also gave us a decent amount of time to get to know our local Wetherspoons, which was conveniently located about a 10 second walk from our Travelodge and served pints of pale ale for just TWO POUNDS FORTY FIVE. Even in a London 'spoons, you're looking at double that price! Our first night was pretty uneventful as our lack of sleep from our bus journey the night before finally grabbed defeated us, so we grabbed some chips from Harbour Chippy (they cook in vegetable oil - yay! ), scoffed them on the beach and headed back to the hotel room to watch TV and fall asleep. The hotel itself is located directly opposite the train station (and around an minute walk from the bus station) right along the beautiful coastline. The hotel itself is exactly what you'd expect from a Travelodge - nothing grand nor outstanding, but simple, clean and everything you may need catered to. Our only issue was that the room was incredibly warm, but the staff at reception supplied us with a fan as soon as we mentioned this which made our second night a lot more comfortable! Saturday was our main day to make the most of exploring Newquay, but only after grabbing our second fry-up of the weekend from the Travelodge buffet - yep, they offer Linda McCartney veggie sausages too! 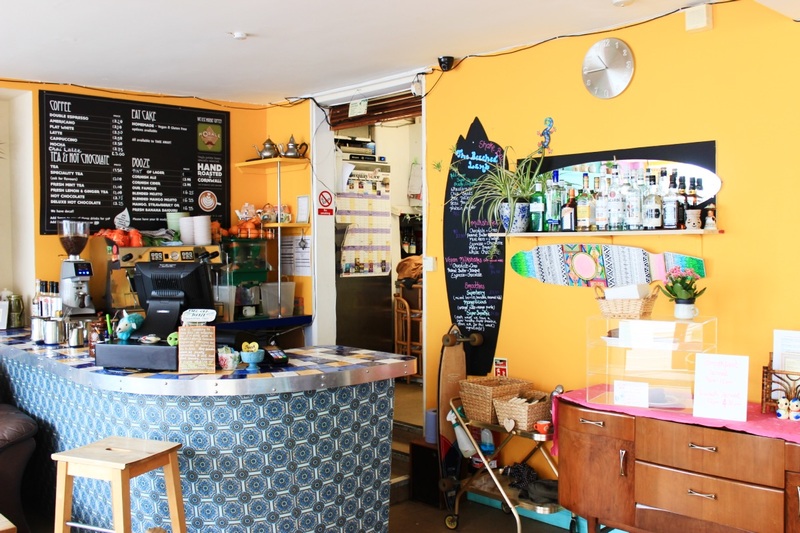 After two helpings at the breakfast buffet, we headed out towards Fistral Beach, which is one of the world's top surfing destinations and is host to big name competitions such as Boardmasters & many more. The sandy beach is overlooked by the Headland hotel, which was built in 1900 and is actually the setting for Roald Dahl's novel, 'The Witches'. Although I was ultra keen to try out my surf skills with a lesson (even though I know I'd be shockingly bad), unfortunately our trip came only a few days before payday meaning we were on a super strict budget so I couldn't afford a lesson. That Saturday morning, we sat with a couple of homemade cocktails in hand, nestled in the sandy banks watching others try their luck with the waves instead. After our trip to Fistral Beach, we began the 15 minute walk back to the town centre but we were distracted by the colourful sign of Gilmore's Newquay, a Mexican restaurant, bar and home to a mini golf course! Entry to the mini gold course cost us just £2.50 each and it was honestly my unexpected highlight of the entire weekend! In our four years together, James and I had never played any form of mini golf together and it just so turns out that after a couple of drinks, I'm pretty swell at this golf malarkey! Maybe it was the liquid courage, but I somehow managed to wrangle two holes-in-one, in where they bounced off of the course before bouncing back in straight into the hole. My excitement may have got the better of me as I screamed and danced around the course when it happened, because I'm definitely not a humble winner! As I mentioned before, we were on a pretty strict budget so we didn't get to explore as much of the local cuisine as we would have liked. However, when in Cornwall it seemed only fitting that we should try some of the Cornish Pasties from one of the multiple shops dotted across the town. I was actually pleasantly surprised to see the amount of vegetarian and vegan options that extended beyond just the predictable cheese & onion! Over the course of the weekend, we were pretty much fuelled by pasties and tasted the following veggie-friendly pastry treats: 'Vegan Green Thai', 'Spiced Chickpeas & Spinach' and a 'Feta & Sweet Potato'. They cost around £3 - 3.50 each, but we did find that around 4pm in The Cornish Bakery they mark all of their pasties at 2 for 1 - bargain! 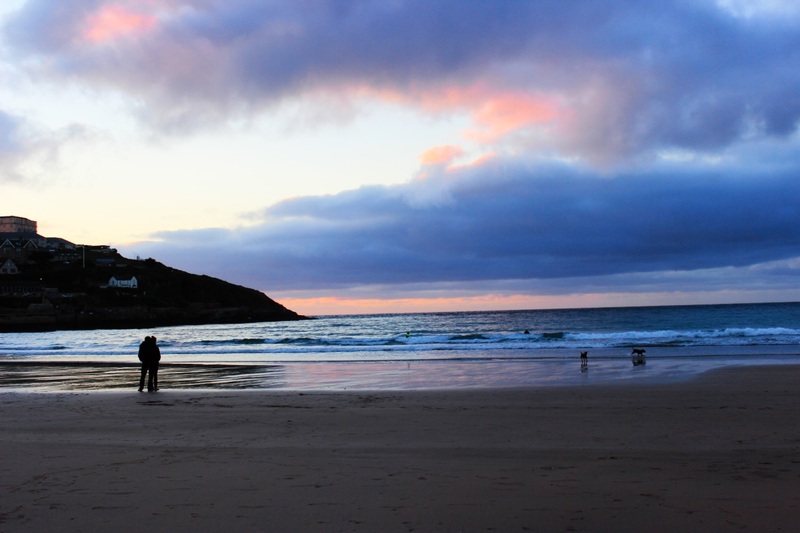 As the evening approached we decided to head back to the hotel to ditch our beach gear from the daytime, get changed, grab a bottle of Prosecco from Aldi (conveniently located right next door to the Travelodge as it happens) and head to Towan Beach to catch the sunset. The iPhone weather app had predicted rain all weekend, but we had seen nothing more than a little cloud coverage all day but the clouds parted ways to display the most spectacular sunset for us. Granted the view would have been better from Fistral beach, but unfortunately we didn't have the time nor energy to make it that far from the hotel. It was the most idyllic ending to a day of relaxing in the beautiful coastal town. Check out on the Sunday was at 12pm, but we were still awake at 8am eager for our third and final veggie fry-up of the weekend from the breakfast buffet. As our train back to London was at 5pm that day, we decided to stay close to the town centre and not stray too far. We pretty much covered everything we had seen in the previous two days, and spent most of the lazing around on the beach whilst we could. If there's one thing I really appreciated that weekend, it was the sand beneath my feet and the sea air in my lungs. I'm not someone who often 'stops' and I tend to panic the moment I begin to relax; I often find myself painfully bored whenever I start to 'relax', especially when I'm on holiday. I often plan to use every single moment away in order to see as much as I possibly can in the time restricted I have. However, there was something about visiting Cornwall where I actually found the ability to relax and doze on the beach soothed by the sound of the waves. Disclaimer: Accommodation & transport was kindly provided by Travelodge for the purpose of this blog post, but all words and opinions are my own. LEIGH YOUR PICTURES <3 Your trip sounds awesome, and I LOVE that you did Mini Golf! Gosh I want to go back to Newquay ! Only had a glimpse on my London-Penzance bus ride and it looked amazing ! Wow it looks like a lovely trip, the travel lodge looks really very nice too. Stunning photos, i love the look of the breakfast. I've never stayed in a Travelodge or visited Cornwall before. It looks really beautiful - I've never been before but would love to. I live in Pembrokeshire which is really similar to Cornwall - very beautiful!